If this gets lodged into your dog’s paws or between their toes, it can be incredibly painful. Wash your dog’s paws thoroughly after walks to avoid this. Make sure your hamster, gerbil or other small pet’s water bottle doesn’t freeze overnight by keeping it insulated – bubble wrap can be a great help. Pets tend not to exercise as much during the winter, so take extra care not to overfeed them. Stick to their recommended dose and they’ll be just fine. A sudden change in your pet’s environment can be quite stressful for them; they’d much prefer a slow, steady Christmas transformation. Keep your pets away from anything they can swallow, too. Is your tree a real one? 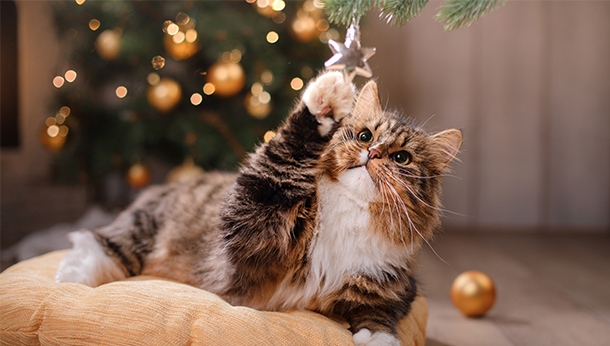 If you have a real Christmas tree, you can prevent the needles getting all over the carpet (and potentially harming your pet’s paws) by keeping it watered. 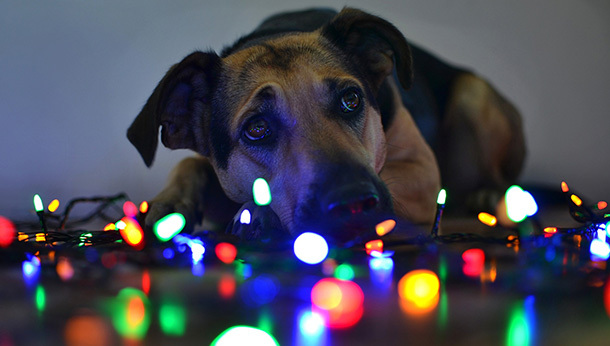 Avoid leaving your pet alone with the tree, decorations they can swallow or Christmas treats that could poison them. Chocolate, alcohol, mince pies, cooked bones, xylitol, corn on the cob, garlic and fatty foods are all toxic to dogs and cats. Make sure you keep these foods well away from your pets at all times. Nothing says ‘I love you’ like the perfect gift. Also, gifts like puzzle feeders can help keep your pet’s mind occupied. Try not to scare your pet with Christmas crackers, champagne corks and other loud noises. Your pet should have somewhere to go if they need peace and quiet, somewhere they feel comfortable and they can be alone. If you’re lost for ideas, covering their crate with a blanket can work well. 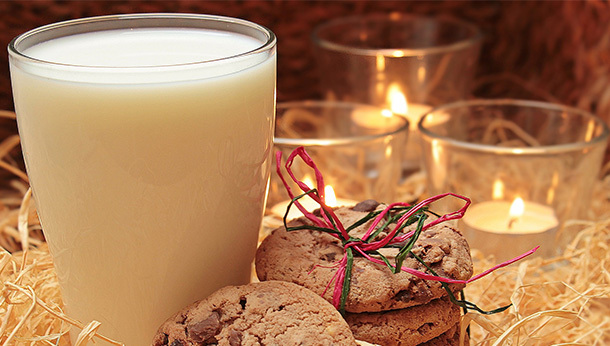 If you’re leaving a special treat for Santa, store it up high, preferably in a room your pet can’t get to. What are your friends and family like with pets? Are they happy that your pet is coming along? Do they make a habit of leaving the mince pies lying around? It’s useful to check up on these things well in advance of Christmas. If you’re embarking on a long drive with your pet, bring lots of toys and allow them regular toilet breaks. Are their vaccinations up to date? Have they had their flea and worm treatment? If you’re doubtful, contact us right away! If the Christmas period is too much for your pet, think about getting a pheromone spray or diffuser. If you’re unsure about these products, pop in and ask us – we’ll happily advise you. We wish all of our clients and their pets a wonderful Christmas! If you have any queries, don’t hesitate to contact us.